Please refer to our stock # 6079 when inquiring. 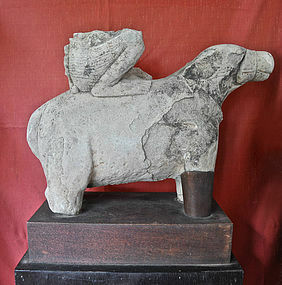 Khmer stone fragment of Shiva on his mount Nandin, of gray sandstone. Dramatic profile. The provenance for this piece is an origin in Phanom Rung, which is now in Thailand but part of the Khmer Empire during the 10th to 13th century. Measurements: H 15 1/2", L 22". Teak base 3 1/4" x 16 1/2" x 10". Provenance: Private collection since 1968.